Lunatics Kirsten Shelton, Mónica Cervantes & Eduardo Zuñiga. Photo by Jonathan Mackoff. The irrepressible, glass-wearing, fierce friend Moniquilla is back with her friends Matias and Veronica for another magically crazy adventure in the second year of the Luna Niños Family Series presented by Luna Negra Dance Theater. Last year had the trio up against the evil Nico, but with a little help from the audience and a lot of laughter, he turned into one of the good guys. 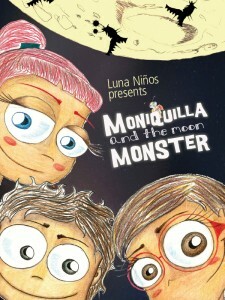 This year Moniquilla enlists his help to find a missing Matias in Moniquilla and the Moon Monster. Zuñiga, 27, is up for the challenge. He’s a natural running rehearsals at their State Street studio and flashes a mischievous grin when talking about the show. He won’t give away all the secrets – there is, of course, a surprise plot twist! – but will divulge the action revolves around an alien and The Book of Magic. Injuries to company dancers may force him to jump in and perform, but for now, he’s enjoying working with his peers on this contemporary, family-friendly tale of magic, friendship and fun. Illustration by Patricia Marín Escutia. Luna Negra Dance Theater presents Moniquilla and the Moon Monster at the Ruth Page Center, 1016 N. Dearborn, Friday, Nov. 30 at 7 pm and Saturday-Sunday, Nov. 1-2 at 3 pm. Tickets are $15; visit www.lunanegra.org or call 312.337.6882. This entry was posted in arts, contemporary, culture, dance, Eduardo Zuniga, Gustavo Ramirez Sansano, Luna Negra, Luna Negra Dance Theater, Luna Niños, Monica Cervantes, Preview, Ruth Page Center, Titoyaya Dance Project by Vicki. Bookmark the permalink.